In addition to the well-established and widely accepted ground rules on farting at the urinal, there lies another golden rule: No mouth stuff. Ever. That means spitting, burping, and above all else, talking. Still, there remain some men who, for reasons we’ll get into, treat the bathroom like it’s a Goddamn roundtable. 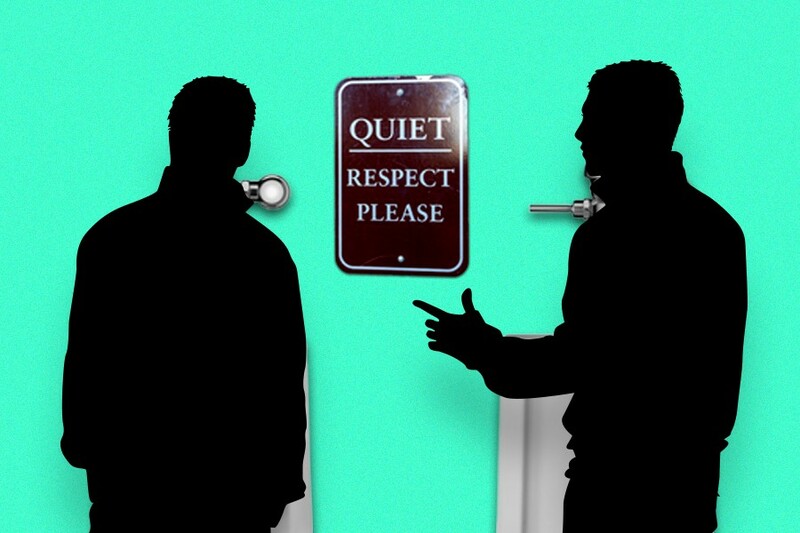 We reached out to these bathroom talkers to find out why they are the way they are. When it comes to pooping, however, Greg sprints in the opposite direction of the bathroom socialite. “I’ll even tuck my ID into my pockets so it doesn’t hang around my ankles, below the stall line, where people would then know it’s me in the stall,” he says. Both at work or at the bar, John and his friends use the bathroom as a safe haven from interruptions or eavesdropping. “My boss and I hash things out while peeing all the time,” he says. “It’s often one of the few times we can communicate quickly without interruption, especially if it’s just a quick discussion.” Nevermind Slacking or stopping by each other’s desk, these bathroom talkers argue, leave it to the serendipity of a bathroom exchange to see about that raise. Shy Bladder Syndrome is very real, and detrimental to those that have it. For most, this prevents men from peeing because they believe, among the myriad things that give us anxiety, everyone else in the bathroom is staring at them. As such, those who suffer from paruresis are encouraged to do anything they can to “avoid any negative self-talk like ‘I’m never going to pee,’” says the Department of Health and Human Services of Australia, adding those who suffer should make any changes they can to take their mind of the anxieties of public restrooms. In a similar fashion that doing math helps you release the pee by focusing your mind elsewhere, so too might an anxious urinator strike up conversation to open the flow. According to a 2012 study, men especially feel the need for privacy in the bathroom and any intrusion on the delicate act of quietly-understood ignorance (or “civil inattention”) in the bathroom can prevent your fellow man from being able to pee. In other words, just keep staring deep into the white concrete wall in front of you, and most importantly, let it out down there instead of your mouth. Otherwise, no one may be able to piss.